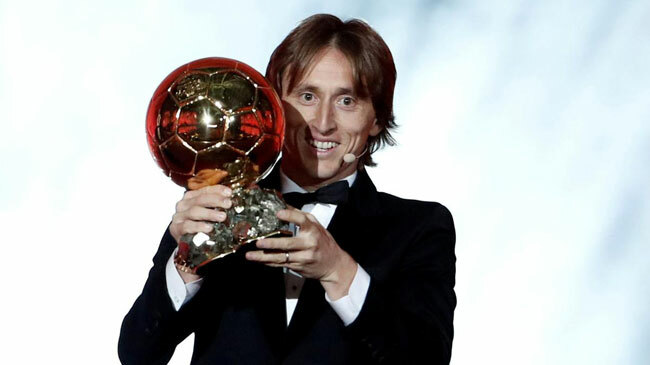 Luka Modric ended the long reign of Lionel Messi and Cristiano Ronaldo by winning the Ballon d’Or for the first time on Monday, while another first saw Norwegian forward Ada Hegerberg win the inaugural women’s trophy. Either Messi and Ronaldo had won every Ballon d’Or since 2008, and usually fought only each other for the greatest recognition among football’s elite. Women’s fight for recognition on the biggest stage took a big step with Hegerberg’s award. Modric won the Uefa Champions League with Real Madrid, then guided Croatia to the World Cup final in July. The midfielder was voted player of the tournament. Ronaldo was second in the polling, followed by France forward Antoine Griezmann. French teen sensation Kylian Mbappe was fourth. Brazil star Neymar was third last year, but only 12th this time. Messi was fifth in the voting, having been runner-up to Ronaldo the past two years and in the top three every year since 2007. Modric had never previously finished in the top three. Modric’s father was shown on the big screen wiping away tears during the ceremony at the Grand Palais in Paris. Ronaldo missed out on a record sixth award, which would have moved him one ahead of Messi. The last player to win it before the pair began dominating world football awards was Brazil midfielder Kaka with AC Milan in 2007. Ronaldo also won the Champions League last season with Modric, before leaving to join Juventus. He scored a hat trick against Spain at the World Cup, but failed to make an impression when Portugal lost to Uruguay in the round of 16. Mbappe and Griezmann scored in the 4-2 World Cup final win against Croatia, while Mbappe earned a domestic treble with Paris Saint-Germain. Griezmann also scored twice for Atletico Madrid in the Uefa Europa League final win against Marseille. France coach Didier Deschamps said a player from his country should have won the award. “They deserve it because of what they did with the national team at the World Cup and also because of the trophies they won with their clubs,” Deschamps said. Mbappe, 19 – the youngest player to score in a World Cup final – won the Raymond Kopa Trophy awarded to the best young player. The outspoken Hegerberg, 23, said she won’t play for Norway at the Women’s World Cup in France in June. Taking a stand against what she describes as a lack of respect for female players in Norway, she hasn’t played for her national team since last year, when they crashed out of the group stage of the Women’s European Championship without scoring a goal. Speaking in an interview shortly before collecting her Ballon d’Or, Hegerberg said on Monday that she has no plans to reconsider her decision taken to preserve her “authenticity and my values, as a person, as a footballer”. “A lot of things need to be done to make the conditions better for women who play football,” she said. “It’s all about how we respect women’s football. I don’t think the respect has been there.